"can I get a cup of sugar please?" Just because your neighbour does not want you to think that she is here only for some work, she will start talking to you. Your five minutes are gone, husband has a newspaper in his hand and your sink awaits for your ice tea. We usually associate neighbours with either gossips or our SOS when we do not have some ingredient that's is essential for cooking. We count on them for a tomato, or a cup of milk, or a needle; but we do need them. But they needing us? - hmmm, that can be a bit frightening; especially when they leave their kid with us for a few hours; who has a tendency to break anything and everything he touches; or when we have to take care of their dog when are are away on a few days trip; and the dog loves to pee on the carpet. We loathe them when we happen to be a teenager; parents are out of town and there is a party at our place. Few guys and girls are about to enter when Mrs. Sharma opens her door; looks at you and gives you that "I know what you are upto" smile. Zynga Company - the makers of farmville game - has studied the behaviour of neighbours pretty well; for, they have made sure that you have to ask for something or the other all the time from your farm neighbours. Real world or virtual world; neighbours do matter to us all the time. Sometimes we are jealous of them when they upgrade themselves; we compete with them just to prove our point to them; we stand by them when a tragedy has struck them; we dance with them if there is a wedding in their family. We need them as much as we run away from them. "You love them or you hate them; but you cannot ignore them"
Definitely neighbors are important as in bad times they surely come out to help and socialization is important as human beings are social animal...both need each other. Virtual world thesedays are sometimes more real:)!! As always nice n diff post from u :)!! Nice that you wrote about our need for neighbours and how we depend on them... Good work.. So true..."Love them or hate them...but can't ignore them!" Predominantly you will experience the latter variety!! Like today, while I was deep in thought and was in midst of writing something, there comes our neighbor and asks me to search for the train schedules of a X and Y and Z and A and B and C trains on the web!! Gosh!! Of course, there are good kinds too! and the best part is we cannot do anythin about them..
Nice one. Very well said about the neighbors. You can't live with them. And, you can't live without them. In our household we have a balanced mix. I never talk to my neighbors. But my wife is friendly with all our neighbors and talk them. Yes the neighbors...are an interesting lot...every one is different....and well havent played farmville yet so dunno much abt it...but yes u cant ignore neighbors! I never ever talk to people around where I stay. dont know if its good or bad. But my mom is just opposite to me. She knows everyone and anyone!! I get wary if someone knocks on my door, I am like "My privacy is being invaded"..
My Uncle and Aunt (Dad's bro and his wife) are our neighbours, so its family. The other old couple hardly stay in the country, they are always away to meet their songs/daughters in US. Yeah but having family as your neighbours is even tougher. Everything you do pops up in family meetings and everyone goes like , "You are a gilr". See, if not for then i would not know :P. But yeah there are upsides too... when were we something they are right there to help :P.
really ..neigbours are very important specially in today's world when families are staying at long distances. Well its so boring without neighbors. Strong walls make for better neighbours they say ! 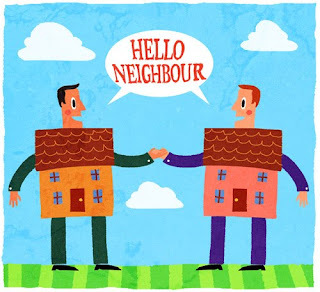 having good neighbours is a matter of social connect and something that is inherrently present with all of us ! So good neighbours make all the differenc and bad ones can make your life really miserable. Who hasn't experienced the busy body neighbourhood auntijis? But i do agree with you, yes we need them as they also need them. Sure, neighbours are an essential part of ones surroundings, especially if so if one stays in a condominium. I think one must stand to help the neighbours but a reasonable distance must be maintained. Well, we have our neighbour working with Pepsi. She comes to us only when she goes out of town expecting us to take care as her maid is alone at home. We have not yet ever refused. I miss this about India.. in Sweden, one hardly talks to his neighbors... though recently in India as well I have noticed that people dont even know who their neighbors are!! @ Avada, yeah; it's different everywhere..
@ Panorama, poor you..a spy in the neighbourhood is the worst thing one can ask for..
@ Holy Lama, so true.. Man!! I know I am repeating myself.. but you HAVE become a blog celebrity!! !